Ahh, the tall order of the perfect shampoo bar. If you've already made the switch to natural shampoos, or have considered ditching the SLS, chances are you've looked into trying various shampoo bars. There's a strong likelihood that, as many of us green beauty users have discovered, you've yet to find the perfect one. And that's totally cool, because, hot tip: the perfect shampoo bar doesn't exist. I'm not saying a stellar shampoo bar isn't out there waiting to be discovered, but the chances of you finding a completely perfect bar of shampoo that does everything you need it to, and more, is pretty slim. Some shampoo bars claim to be green but really aren't; some market themselves as natural alternatives but really aren't, and others simply put no effort into hiding chemicals and artificial ingredients lurking between so-called "organic" or "natural" additives. You may be surprised to find palm oil or its derivatives creeping through a shampoo bar's ingredient list, whilst others will straight up contain SLS - aka Sodium Lauryl Sulfate - the dangerously damaging chemical found in most liquid shampoos which cause them to lather. Because many liquid shampoos are detergent based, shampoo bars have become the seemingly "obvious" alternative, with self-proclaimed green giants like LUSH selling prettily packaged, heavily scented bars meant to cleanse and add volume to hair. But before you dive into the world of the shampoo bar, there are a few things you should know; tips that can help you find a bar that works for you and which can make the switch from liquid to solid shampoo a breeze. Put simply, shampoo bars are solid versions of shampoo, often made with more natural (and less artificial) ingredients. Typically - but not always - shampoo bars will be crafted without harsh chemicals and damaging additives or preservatives, but this doesn't necessarily mean they're good for the environment. Many, for instance, utilize palm oil or palm derivatives for texture, whilst others may include in their ingredients artificial fragrances and dyes. None of these additions are good for your hair, either, but they sure do make a shampoo look and smell pretty. The first time I used a shampoo bar, I had purchased LUSH's "New" shampoo bar, whose first ingredient just so happens to be SLS (huzzah!). I was deeply disappointed with my experience, which consisted of having to rub the bar throughout my entire head of hair for seriously minimal lather; it left my hair feeling dry, frizzy and not so clean. I later learned that SLS can be extremely drying and damaging to hair, which had me chucking my LUSH bar in the bin fast enough to make my head spin. Companies like LUSH like to claim that all is kosher when it comes to SLS, but many disagree, and you'd be hard pressed to find many natural soap brands including the harsh chemical in their own bars. Essentially, shampoo bars are solid bars crafted with butters, oils, essential oils and botanicals that should be SLS-free and exclude the use of artificial fragrances, chemicals, and harsh preservatives. Like natural body soap bars, natural shampoo bars will likely have little lather or bubbles to them because they often don't contain an artificial lathering agent. When looking for a shampoo bar, keep an eye out for ingredients like shea, mango, cocoa and other nourishing butters, along with coconut, jojoba, avocado, argan and other moisturizing oils. Essential oils may be used to promote certain properties, such as rosemary and lavender for healthy hair growth, or chamomile to keep blond hair looking bright and, well...blond. They may also be used to add natural fragrance to a bar. I avoid shampoo bars that utilize palm oil, palm derivatives, artificial perfumes or fragrances, and SLS. Instead, I focus on sourcing shampoo bars with highly nourishing butters, oils, and botanical extracts. If you're vegan, don't stress - there are many brands which make vegan-friendly shampoo bars without the addition of ingredients like milks, honeys, or other animal byproducts. WHAT PROS DO SHAMPOO BARS OFFER? One pro to using a shampoo bar in place of liquid soap is that most shampoo bars don't contain SLS and won't dry out or further damage your hair. You may also find that a shampoo bar more thoroughly cleanses your hair of chemical residue left over from liquid shampoos, especially if you utilize liquid soaps high in artificial ingredients and preservatives. Often, shampoo bars are kinder to various hair types, as their more natural ingredients can promote better hair health versus liquid soaps filled with ingredients like SLS. It's no secret, too, that shampoo bars are more travel-friendly can be more cost effective, lasting longer than liquid shampoos if you store them properly. "There are various methods for crafting soap, which include a simple method called "melt-and-pour." However, not every method is a good method, and the melt-and-pour method of creating soap means you could end up purchasing a bar or two made with palm oil. Eeek! Melt-and-pour soaps are made using pre-made soap bases which often contain palm oil and animal fats, something you want to avoid (see my next tip) when buying natural soaps. Cold and Hot Processed soaps, on the other hand, allow makers to create soap from scratch, controlling what goes into each bar, how long their soap cures for, and what fats/oils they use, making cold or hot processed soaps the better option." For shampoo bars, there are mainly 3 types: cold-pressed, glycerin based and solid surfactant. I'll briefly explain each below. Cold-pressed: the process of mixing fixed oils (like coconut) with an alkali (such as Lye) to achieve saponification, where the composition of the fixed oils changes thanks to the alkali. These soaps are often rich in nourishing fats (like oils and butters) and are often SLS-free. However, because of the oils and butters, many users like to rinse their hair with a clarifying product (such as an apple cider vinegar rinse) to prevent build up on the scalp. Glycerin-based: glycerin is a natural byproduct of the soap making process, and soaps containing natural glycerin tend to be kinder on the hair and scalp due to their lower pH levels, which help to keep the peace with your hair's own pH levels; this is said to help hair and skin maintain moisture. However, some soaps contain added types of glycerin, such as that derived from palm oil, to increase glycerin content. If you're looking to avoid palm oil in your shampoo, keep an eye out for palm oil in the ingredient list. Surfactant: soap containing a surfactant will often provide the most lather because surfactants are a compound of detergents which cause bubbling or foaming (aka lather). Common surfactant soaps are those found at LUSH, for example, and often contain SLS. The main purpose of a surfactant soap is to remove the dirt, oil, and bacteria from something, like your hair and can be extremely drying/clarifying to the point where they can do more harm than good to the health of your hair. Surfactant shampoo bars thus work well in conjunction with a conditioner. 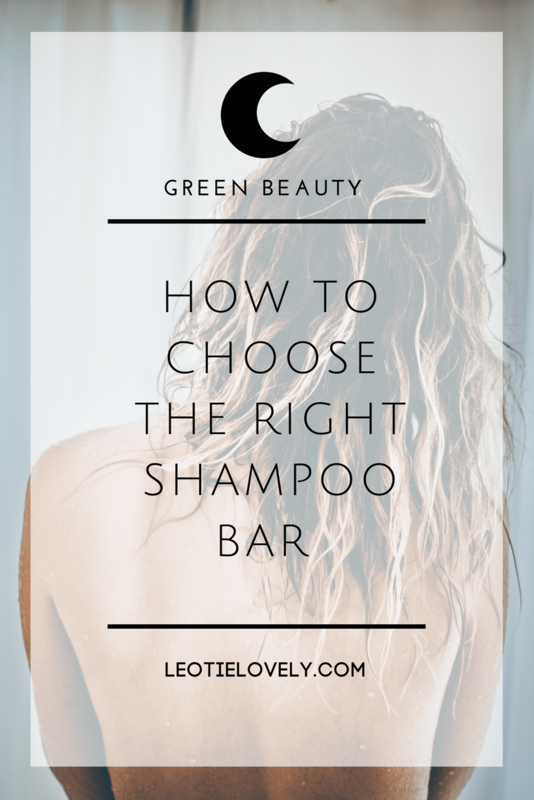 Choosing the right shampoo bar will really be a result of trial and error; there is no one specific shampoo bar that will work for every hair type, nor are shampoo bars going to solve every hair issue or concern. My greatest piece of advice would be to avoid surfactant shampoo bars, any that contain SLS, and those made with palm oil or palm-derived glycerin. I'd also recommend avoiding shampoo bars that contain any type of sulfate, and you should also pay close attention to bars whose ingredient lists feature sodium hydroxide - it is an extremely strong alkali which has a higher pH level than your hair. Because the hair doesn't have an acid mantle (your skin does, though!) the difference in pH levels can cause your hair to become coarse, brittle and, over time, quite damaged. The optimal pH level for hair is around 4-5. However, and this is important: some natural shampoo bars will contain sodium hydroxide. In my experience, it is sometimes unavoidable, and two of the soaps I recommend below contain it (Meow Meow Tweet and Urban Organics)*. WHICH SHAMPOO BAR SHOULD YOU TRY? Here are a few recommendations to start you off on your journey to finding the right shampoo bar for your hair. Keep in mind that you may have to play around with different bars to find the right one that works for you, and the method of using a bar may differ from one bar to the next. I'd say finding your own rhythm is important, and sticking with a shampoo bar once you find the right one for your hair will help to better balance your hair - consistency is key! Thanks so much for sharing our Rosemary Mint Shampoo Bar! We love it and our customers do too. Just a quick note regarding Sodium Hydroxide in soap. Sodium Hydroxide is simply the chemical name for lye. Lye is necessary to make cold process soaps. The lye combines with fat in a chemical reaction called the saponification process, heats up and changes into lovely soap! You cannot have soap without lye. That said, no lye remains in finished soap, and the pH of a finished bar of soap should be between 7 (neutral, think water) and 9 ( a bit base - think baking soda ). So not to worry if you see Sodium Hydroxide on an ingredient list, by the time the soap reaches your shower it will be long gone. :) Enjoy!